Sally is next up. 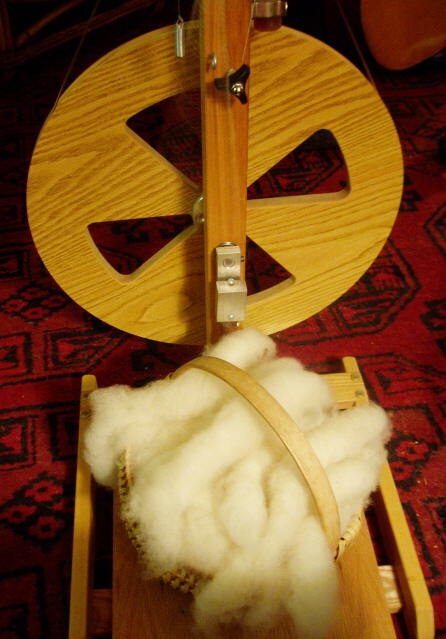 Well…I don’t have any more Holly clean and ready to spin. See the thing is…our A/C died. This is Florida. It’s Hot. We did some research and determined that a new compressor for our old A/C would cost about the same as a few wall units. So, we did what any red-blooded Americans would do…we went to Lowe’s and picked up a wall unit. When we got home, it was 95 degrees in the house. That was at 5:00. It is now 9:19, and the temp is down to 90. The way our house is situated, (don’t blame us, we didn’t stick it here), the afternoon sun gets worse and worse until sunset. Well, we should expect the temp to plummet fairly soon. But, til then. Ack. Anyway…this is all i could accomplish, and I want a medal for it, at that. This is about 4 ounces of “Sally” – blonde GC ewe. Mmm. Maybe I’ll get to spin her tonight. And just maybe I’ll let y’all in on a secret too. But not right now. Right now, it’s time to post this pic.